Get CBSE sample paper from class 10 Mathematics SA 2 examination 2017. This paper is very important for the coming CBSE Class 10 Mathematics SA II, 2017 Exam. 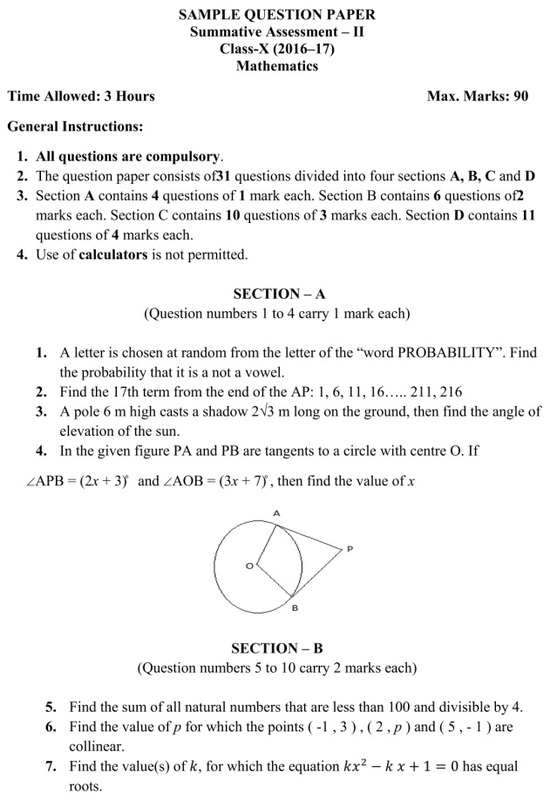 CBSE sample paper for class 10 Mathematics SA 2 exam 2017 is available for download along with answer key and marking scheme of the paper. Every year CBSE publishes sample papers for Class 10 and Class 12, few months before the board exam. With the help of these sample papers students get an idea about the latest CBSE examination pattern. The board has now released the sample paper for class 10 Mathematics SA 2 Exam 2017 along with other subjects. This CBSE sample paper is very important for the coming CBSE class 10 Mathematics SA 2 exam 2017. Section A contains 4 questions of 1 mark each. Section D contains 11 questions of 4 marks each. Hints and answers of all the important questions are given at the end of the question paper.